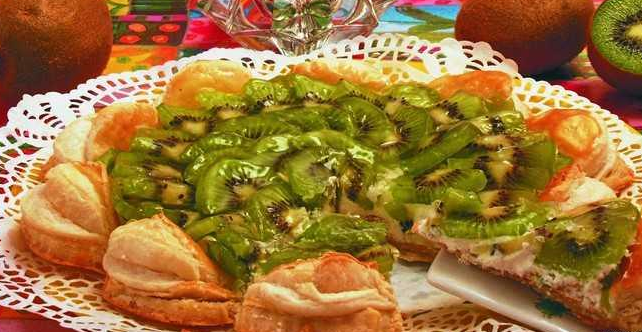 If you like delicate fruit desserts, then be sure to prepare a layer cake called "Kiwi". This delicacy is not only delicious, but also it will decorate any festive table. - kiwi - 1 PC. - gelatin - 8 g.
Put the eggs in a separate Cup and whisk thoroughly. Then add to them the sugar, salt and milk. Mix well. Then enter in the mixture of flour. Knead the dough. Kiwi peel and chop using the coarse grater. Add fruit to the batter. All mix, then cover with a damp towel and place in the fridge for approximately a quarter of an hour. Butter beforehand to soften, then mix with 2 teaspoons of flour. In this form, send in the refrigerator for about 20 minutes. The dough roll out with rolling pin and place on the middle of the cooled mixture of butter and flour. Cover it with edges of dough and zasypnica. The result should be something like envelope. Wrapped in the envelope of the dough roll so that its thickness does not exceed 1 centimeter. After this procedure, fold it, cover and refrigerate for 20 minutes. So do a couple of times. The resulting dough is cut into 2 pieces of equal size. Then roll each of them in the form of cakes. One of them, place on a baking dish, and the second divide by the circles. These pieces fold in half, then place on the edge of the base cake. Preheat the oven to a temperature of 200 degrees. While it's heating up, laid on the dough, grease egg yolk. In this form, send it in to bake for approximately half an hour. Meanwhile, prepare the filling. Connect the cream with the sugar and whisk thoroughly. Dissolve gelatin in small amount of warm water and leave to swell. Then add it to the butter-sugar mixture. Mix well. The obtained gelatinous mass pour onto baked base. On top put chopped slices of fruit. The edges of the pastry decorate icing sugar. Send the dessert in the refrigerator until fully cured. Layer cake, Kiwi is ready!